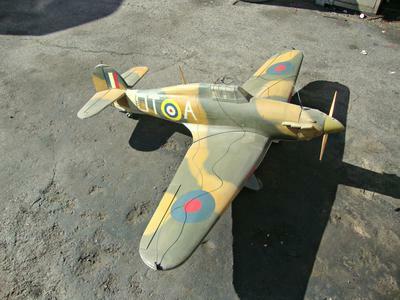 I am hoping you can help me out in appraising some airplanes and advice where to sell them (on-line or locally). They are older and rather dusty as well as being in different conditions. I would have to say that none of them are in cherry condition. I am in Texas And selling them for a friend in Los Angeles. When I visited him I took some picks and got what info I could. They are the bigger ones with wing spans from 57" to 61". plus one big one with a 16' wing span. They all have gas engines and servos but no remotes. The real cool ones are the war planes I think. Based on your wingspan and motor descriptions the bulk of the planes sound like .60 size nitro planes. Meaning they have between at least a .60 nitro two stroke, .91 nitro four stroke, or equivalent gas motor. Generally, you should start asking between 250-300 for each plane. If you know the motor brand and size, that'll help in the posting. On average you can expect to ask about 33-50% of the new price. So for example, if the kit is still available, start at 50% of that price. If the motors are in good condition (not seized up and holding compression) maybe add another $50 to the price. RCGroups.com classified section will probably be the most beneficial place to sell. Selling on RCG you'll want to post as much information about the aircraft as possible: Manufacturer, engine size, number of servos, servo brand, engine manufacturer, receiver or no receiver, wingspan, any crashes, etc... You can try local Craigslist, but prepared for people want to buy dirt cheap to start the hobby on a complex, advanced aircraft not for beginners.